It’s 1977 and Shay (Daniel Huttlestone), is a lad only weeks from his fifteenth birthday. He feels restless, oppressed and put-upon, living in grotty suburbia with single dad Nick (Dougray Scott) struggling with school and looking after his little sister Alice (Anya McKenna-Bruce). He gets home one day to find a letter and a cassette tape from his absentee mum, who has apparently run off to London to realise her long-held dream of playing in a band. Shay blames his tough but conventional dad for driving away his free-spirited mum. This belief inevitably causes tension between father and son, and after an argument his dad tries to reconcile by allowing Shay a foray into the big city under the pretext of collecting a few items for his failing piano shop. On the train Shay meets Vivian (Nell Williams), an older and savvier teen who introduces him to the world of punk music and its politics and culture. In the late-seventies, Punks, Skinheads and Thatcherism are at loggerheads and the far-right group known as the National Front is peddling white supremacy to the masses. But for Shay, more immediate problems are about to catapult him into adulthood as his family life begins to fall apart. His father is hospitalized after a serious accident involving a falling piano and, refusing help from all quarters, Shay takes on the responsibilities of looking after his sister and running his father’s business. His new friendship with punkette Vivian becomes invaluable as she teaches the underage Shay to drive his father’s taxi and disguises him so that he doesn’t look too young. She babysits little Alice and helps around the piano shop. One of Shay’s night time taxi fares happens to be Joe Strummer (Jonathan Rhys Meyers) of his favourite band The Clash, who then seems to turn up in all sorts of unlikely places, helpfully willing to counsel the young lad during particularly difficult times. When his little his sister falls ill Shay has no option but to find his mum for help. He does find her, in a squat in a dismal London building that she’s sharing with a sundry assortment of punks, anarchists and bohemians. After having to do a bit of growing up himself, Shay finds her irresponsible, free-loving, free-living existence with her new array of boyfriends a lot less inspiring than he once imagined. He learns the truth about her relationship with his father and once his little sister recovers he shifts them back to his suburban life pronto in order to try to stave off economic doom at home. It’s not the only shock Shay’s about to get - it turns out his new girlfriend Vivian is also not quite what she seems. London Town, directed by Derrick Borte from a script by Matt Brown (adapting a project by Sonya Gildea and Kirsten Sheridan) turns out to be a heart-warming but conventional telling of a standard, male coming-of-age story. Shay experiences the confusion, exhilaration, and disappointments of being young, experimenting with music, identity, relationships and sexuality, while the acquiring the questionable advantages of having Joe Strummer as a confidant, managing to spend the night in a cell with him and attending Clash rehearsals. The attempt to recreate late-seventies punk London may be realistic, but in relation to this coming-of-age story, it’s almost incidental. The mood remains rather distanced and impersonal, perhaps as an attempt to indicate the rather contradictory poses of punk - passion and anger, accompanied by disdain and indifference. The cast attempt to bring warmth to the proceedings, making the best of fairly two-dimensional characters throughout. 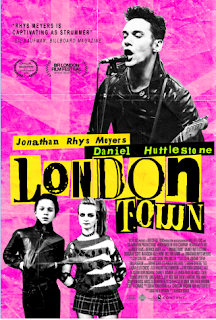 Jonathan Rhys-Meyers also has fun with his portrayal of Strummer, but then this actor has form in playing various iconoclastic rockers (such as the thinly veiled Bowie character in Velvet Goldmine and Elvis in a TV series). Punk could never stop the rise of reactionary Thatcherism, but at least it offered some kind of community for a struggling, working-class kid to belong to.